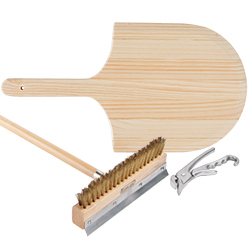 We have the pizza making tools and utensils you need to make pizzas in your establishment. Browse our dough dockers, cutters, pan racks, and graters. Our selection of pizza pans includes products designed for cooking different types of crusts, from thin and crispy to deep dish pies. 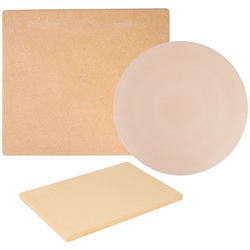 Pizza stones offer excellent heat distribution, ensuring your crusts are baked thoroughly and evenly. 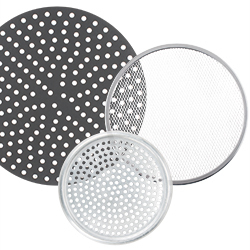 Pizza screens and disks have perforated surfaces to make crispy crusts. Plus, these items keep your pies from sitting in grease, preventing sogginess. Stock up on pizza oven and cooking tools, so you can safely handle hot pans and keep your ovens clean. You’ll find grippers, pizza peels, and brushes. 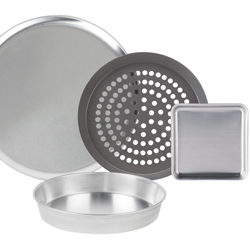 Present pies to your customers with our pizza serveware. Use trays and stands to set pizzas on tables. You’ll also find shakers and pie servers. If you operate a small local pizzeria or a large pizza chain, we have a large selection of pizza supplies for your needs. 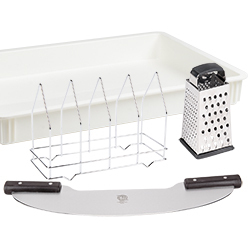 We carry an assortment of pizza utensils, including graters for cheese, and pizza making tools, such as racks for pan storage and brushes for cleaning ovens. By stocking up on these pizza supplies, you’ll make the daily tasks in your kitchen more efficient. For other great items for your establishment, be sure to check out our commercial pizza preparation refrigerators, pizza holding cabinets, and pizza scales. If you're wondering where to buy pizza tools and bakeware, we have a large selection of pizza tools and bakeware for sale at the lowest prices. Essential for your Italian pizzeria or busy commercial bakery, dough boxes are useful and effective for keeping fresh dough at its finest. These multi-purpose boxes perform numerous functions for your business, including proofing dough so that your most popular breads and pizza crusts rise higher with an excellent texture. The classic rectangular shape of dough boxes is perfect for lifting and transporting pizza dough throughout your kitchen. When used with a lid, they can stack on top of similarly-sized boxes for convenient storage. Additionally, they can be used to keep dough moist and fresh for days at a time and help prevent crusting for an increased storage life. With so many benefits and uses, there are plenty of reasons to invest in one of our dough boxes. But where do you begin? This guide will familiarize you with proofing dough and help direct you to the right dough boxes for your unique needs. Did you know you aren't supposed to use water to clean your pizza stone? 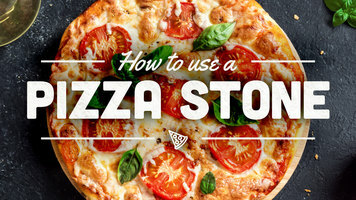 Check out this video and our step-by-step directions for tips on How to Properly Use a Pizza Stone. Outfit your pizzeria, Italian restaurant, bistro, or other foodservice establishment with the proper pizza making tools and pizza utensils. 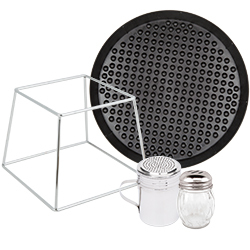 These items enable your staff to make a variety of pizzas, including thin crust, deep dish, and Sicilian-style pies. Whether you’re looking for pizza supplies for the preparation, serving, cooking, or cleaning process, we have you covered. Our selection of pizza making tools includes pans, screens, and paddles, all of which can be used to cook your signature crusts. You’ll also find pizza supplies like dough dockers, which prevent crusts from bubbling up, as well as pizza utensils, like cutters for portioning cooked pies. We even offer items like cheese shakers, stands, and plates that are used to serve the customers dining in your establishment.